A community builds its personality upon many factors. They all contribute to the lifestyle of the people that call the community home. Here are some of the characteristics that, when blended together, make Cambridge a fine city that more than 102,000 people call home. Although a new city, as cities go, the roots of the community date back to the early 1800's when early entrepreneurs saw a perfect location to build their dreams of a thriving centre of commerce. It was on their vision, innovation, hard work .... and willingness to take a risk, that the cornerstone was laid on which Cambridge has been built. More than one in five Canadians live within one hour’s drive of Cambridge. The International border between Canada and the United States is ninety minutes away at Buffalo or just three hours away at Detroit. In fact, a staggering one hundred and thirty million people live within a single’s day drive .... Chicago, Cleveland, Montreal, New York, Philadelphia, and Pittsburgh are just a day’s drive away. 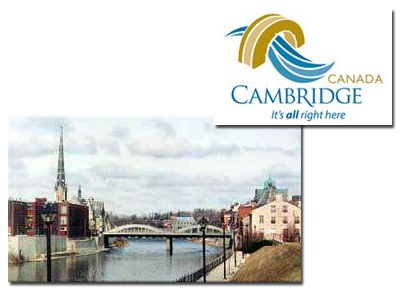 Close to home, Cambridge is located in the Region of Waterloo, an area which is home to over 375,000 people. Cambridge is a unique urban/rural mix that offers the best of both worlds, with the enviable lifestyle that escapes most metropolitan areas. Southern Ontario has a climate and geography unique in North America. Within 90 minutes of Cambridge are some of the finest fresh water lakes in the world, where you can enjoy warm summer days in temperatures that hover in the range of 70* to 80*F (20* to 25*C). Spring and Autumn are a photographer’s dream as nature’s splendor is displayed over pastures and rolling hills. Crisp winter temperatures quickly heat up Ontario’s famous ski runs. Whether your choice is golf, tennis, or simply enjoying your backyard garden, the changing seasons provide the setting for activity and relaxation. With almost two centuries of history, there is a diversity of neighbourhoods and residential complexes in a wide variety of architecture and styles, from which you may choose a home to fit your lifestyle. The outstanding factor is choice. If you are planning on relocating to Cambridge or are a lifetime resident moving around the corner, my goal is to become Your Real Estate Agent...for Life. If there is anything that I may assist you with, please e-mail me today!